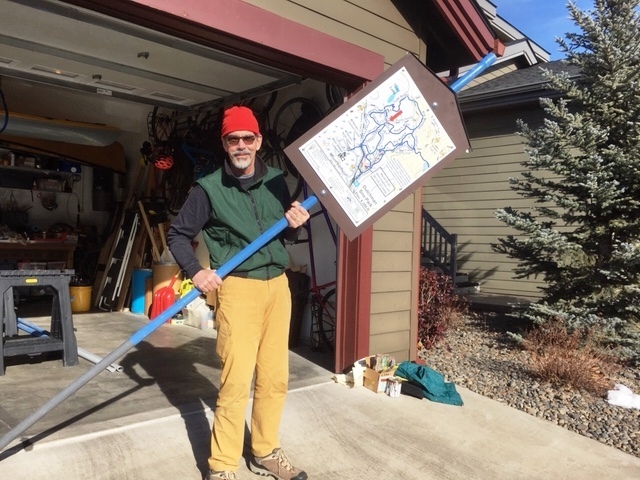 Central Oregon Nordic Club volunteers are in the process of erecting “you are here” signs at intersections of ski and snowshoe trails out of Swampy Lakes and Dutchman Flat sno-parks. This will be an aid for those unfamiliar with the trails, helping them pick which way they might want to go next. The signs could even be a life-saver if they keep people from getting lost, particularly if the signs help skiers and snowshoers get back to the parking lot as nightfall is approaching. 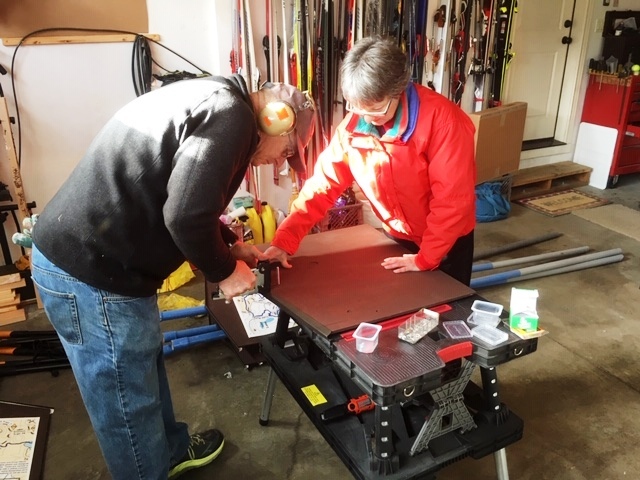 Materials for the signs were obtained through the $4,200 grant the Nordic Club received from the Deschutes Trail Alliance back in August, explains Susan Sullivan, CONC vice president. 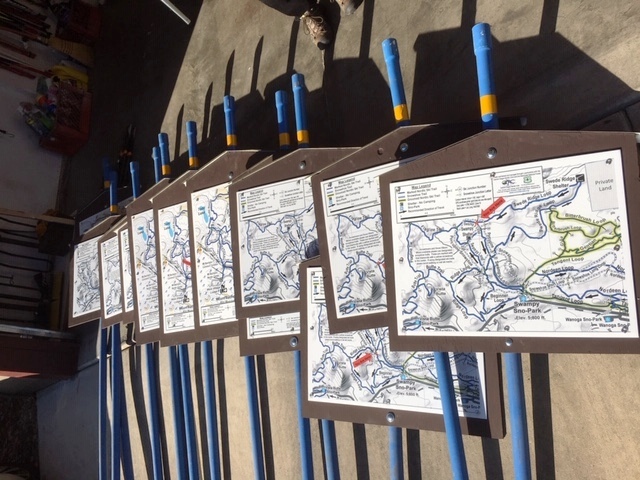 The signs and poles were assembled in town, and now volunteers are in the process of taking them out into the woods. Plans for the rest of this winter are for six “you are here” signs on ski trails leading out of Dutchman Flat and another seven on Swampy Lakes ski trails, Susan reports. Many are out already; the rest should be erected in the next week or so. Another four have been placed on snowshoe trails at Swampy. The signs have considerable detail (see photo at top of story). They include all of the main trails out of a sno-park and even have contour lines showing elevation gain. There is a mark showing skiers and snowshoers their current location on the map. For the Nordic trails, the signs are attached to blue poles that are stuck in the snow. This way, the height can be adjusted for the depth of the snow to make sure they are always readable for skiers and snowshoers. This also means volunteers will have to set them out each year, adjust them and remove them at the end of the season. Unlike the blue diamonds that mark trails, the “you are here” signs cannot be permanently attached to trees at higher-elevation sno-parks where snow piles up high over the course of the winter. “We’ve had a number of people…who have advocated for this for a number of years,” Susan reports. 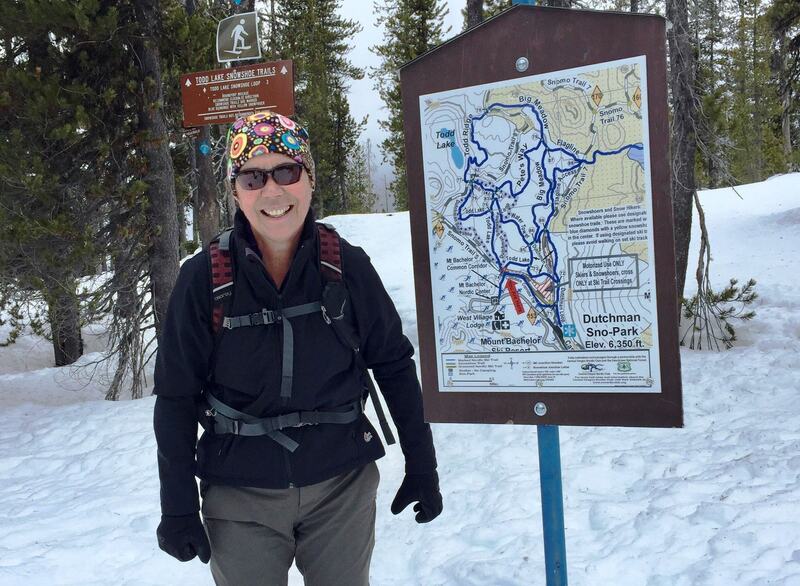 CONC members coming back from the club’s annual trip to Methow Valley in January 2017 were impressed at the signage along the 120 miles of trails in the Methow Valley system, thus they encouraged CONC leaders to undertake a similar effort. 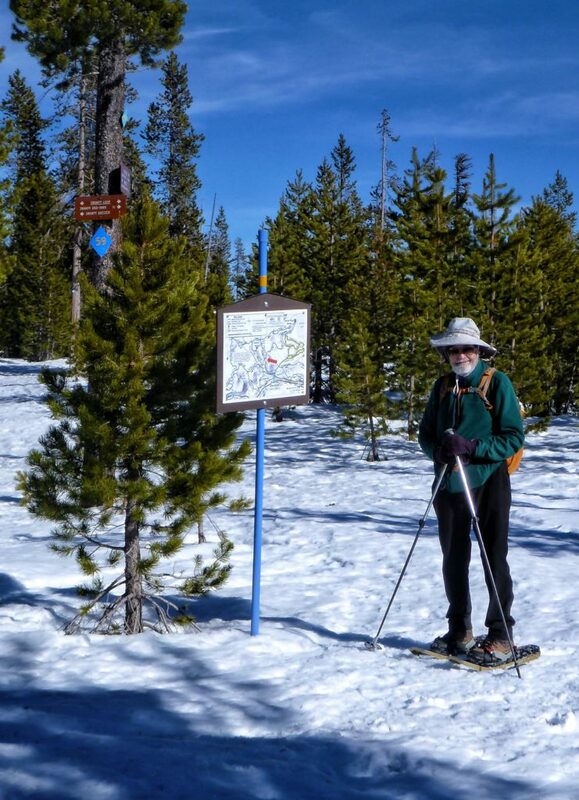 Bob Timmer, the CONC board member who heads efforts to maintain the snowshoe trails, contacted the group that maintains the Methow Valley trails in northern Washington. 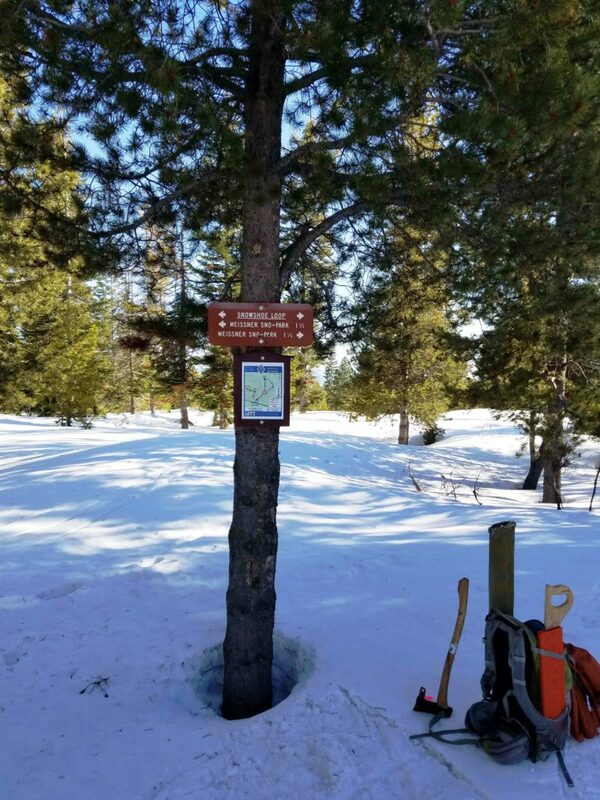 When putting together a grant proposal to the Deschutes Trail Coalition for improvement of signage, the club decided to undertake a trial with the signs in a few additional places to see how they would work out, Susan explains. “For this year’s expansion at Swampy, the YAH signs and signboard were installed on blue poles slipped over steel conduit, with the idea that the pole could be raised with increasing snow level and then settle back down as the snow melts, ready for the next season,” Bob says. So far, Bob adds, feedback has been “very positive” and he looks for the effort to expand next season. Susan says volunteers hope to place signs at Edison Sno-Park in future years. Also, at Swampy and Dutchman Flat, not every junction has a sign currently. 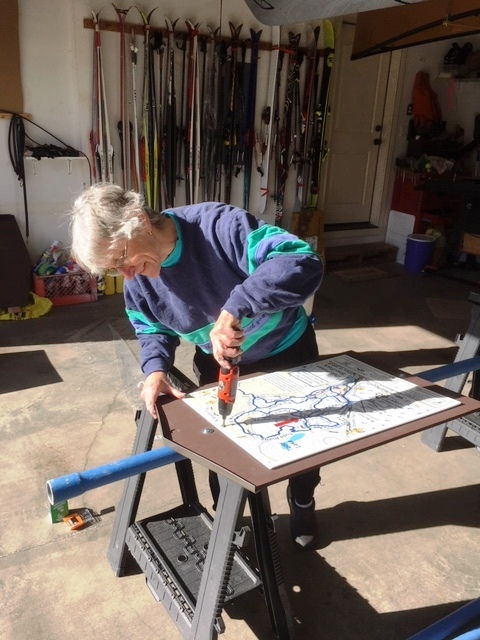 “We’ll see how well they hold up,” Susan explains, adding that club members also have to further coordinate the logistics of installing signs, adjusting the height, removing and storing them. Yet another project in the works is placement of posters with descriptions of different trail loops at sno-parks, Susan explains. This would help skiers and snowshoers pick a route based on their ability levels and time they want to spend in the woods.